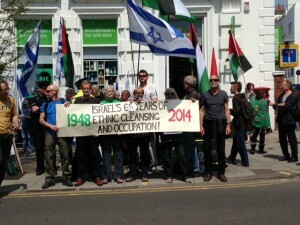 To mark the annual Palestinian commemoration of Nakba Day, local activists staged a high-impact demo outside the EcoStream shop in Western Road. With their mouths taped shut, to symbolise the systematic silencing of voices attempting to tell the story of 66 years of continuous catastrophic ethnic cleansing, demonstrators stood in dignified silence with our banner saying “1948-2014: Israel’s 66 years of ethnic cleansing and occupation!” Meanwhile hundreds of leaflets were distributed to passers-by, with many stopping to offer their support and to discuss the issues with us. The reality of apartheid in Palestine/Israel, and the growing movement for boycott, is now well-known to the Brighton public. Thanks to everyone for your support! 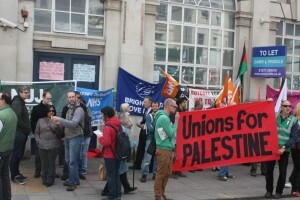 Brighton trade unionists turn out to support the EcoStream boycott! In a magnificent show of strength and solidarity, local trade unionists turned out today to demonstrate their support for the Palestinian struggle and for our EcoStream boycott. 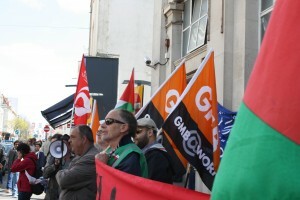 Led by the Trades Council, dozens of members of local branches of many of the major unions, including PCS, NUJ, UCU, NUT, Unison, Unite and the GMB, plus local campaign groups including the Brighton Benefits Campaign and Defend the NHS, joined our weekly picket. 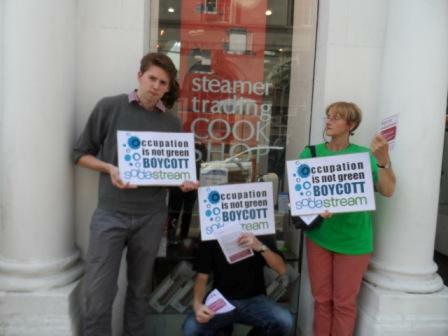 They made it clear that workers’ organisations in the city oppose the presence of a shop owned and operated by a company, SodaStream, that is deeply complicit in human rights abuses and ethnic cleansing in occupied Palestine. Palestinians living in the area near the factory are faced with a terrible dilemma – shun SodaStream or put food on the table. Such a dire predicament is recognisable to British trade unionists, who campaign against similar abuses in the UK such as zero-hours contracts, outsourcing and anti-union policies. Two settings – one struggle. Many of the trade unionists who joined us on the 3rd of May were so moved by the experience that they have promised to take part in our weekly pickets on a regular basis, and to bring their branch comrades with them. We look forward to their support, just as we pledge to support their own campaigns. Thank you! Read the report by Corporation Watch on the Trade Union demo. 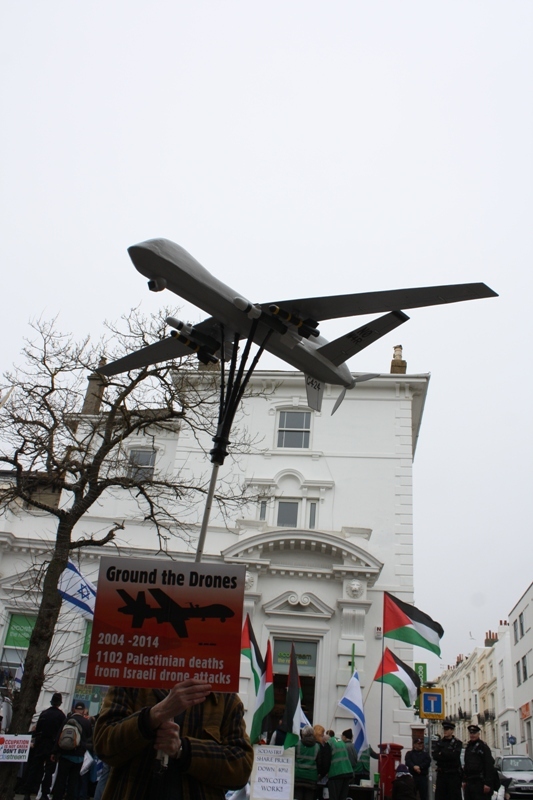 1,102 Palestinians were murdered in attacks carried out by Israeli drones from 2005 to 2014.To learn more about Israel’s use of killer drones, read the full report of the demonstration. 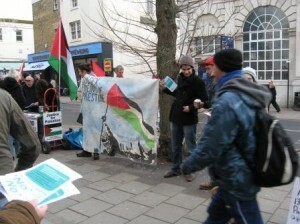 This special demo was one of many planned outside the EcoStream shop to draw attention to the wide range of Israel’s war crimes and human rights abuses, in support of the Palestinian struggle for liberation, and to demonstrate the link between EcoStream’s complicity in ethnic cleansing and the wider struggle for justice. Our regular Saturday protest outside the EcoStream shop in Western Road came at the end of a week of furious debates around the world about Scarlett Johansson’s decision to accept a role as celebrity sponsor of SodaStream, the shop’s parent company (see earlier post here). How could Scarlett agree to bestow glamour on this deeply unethical company and at the same time continue in her role as ‘ambassador’ for the international development organisation Oxfam?Oxfam has consistently maintained a strong position on the issue of illegal Israeli settlements such as the one on which SodaStream has its main factory at Mishor Adumim. Oxfam came under terrific pressure from their supporters around the world – all people of conscience – to sever its links with Ms Johansson unless she resigned from SodaStream. Oxfam was clearly reluctant to dismiss Ms Johansson, but it was obvious that she could not continue in both roles simultaneously. In a decision that was picked up by all the news media, including the evening TV news on the BBC and Channel 4, Johansson resigned from Oxfam, preferring to align herself with ethnic cleansing, violations of international law and human rights abuses. SodaStream and its supporters may be relieved that their celebrity prize stuck with them rather than with Oxfam, but the episode has brought to the attention of the world just how toxic a brand SodaStream is, and how widespread is the support for the boycott movement.Our demo reminded Brighton & Hove that the EcoStream shop and the toxic company SodaStream are one and the same. A day of two demos! On Saturday morning, a group of BHPSC supporters carried out an action at the Brighton Marina branch of Asda. 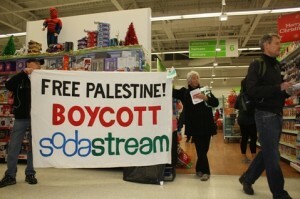 This was in support of ten days of action across the United States targeting Sodastream in the runup to Christmas. 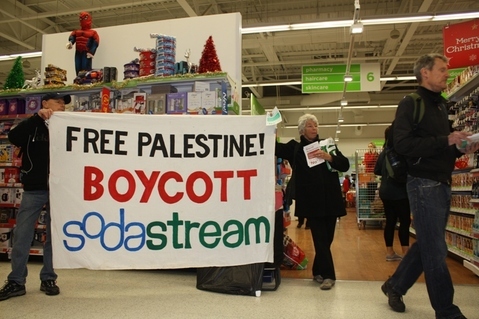 The group removed Sodastream machines and syrups from the shelves, deposited them in the central aisle and unfurled a large banner saying “Free Palestine, Boycott Sodastream”. Although store security were quickly on the scene the group stayed for 45 minutes giving out leaflets to shoppers and vocally making it very clear why Asda was being targetted. Meanwhile a number of supporters who had travelled up from Portsmouth were leafleting people at the store’s lobby. Although some security were slightly pushy, one, one was extremely supportive and completely understood the reasons behind the event. Hopefully he will continue the conversation with his colleagues. In fact, the store manager offered to meet us to discuss our campaign against this deeply unethical company. We intend to take up the offer. It was great to be able to show solidarity with our international comrades. This was a reminder to Brighton stockists of Sodastream that whilst they sell the products of occupation in our city they can always expect a visit! 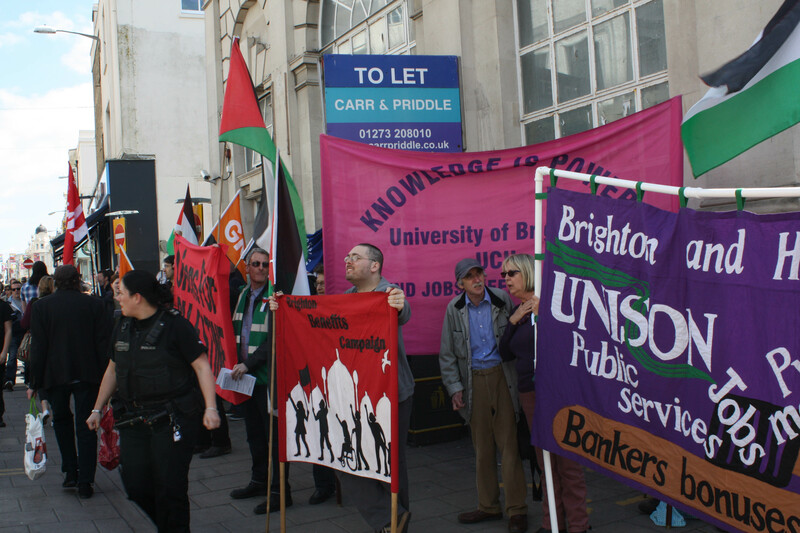 And then in the afternoon, Brighton activists joined the Day of Rage against Israel’s racist Prawer Law. As part of the international day of action, we protested against Israel’s plans to forcibly transfer over 40,000 bedouin from their homes in the Naqab desert. Our 5 metre long banner read: STOP ISRAEL’S ETHNIC CLEANSING OF PALESTINIANS and placards illustrated the historical context, with photos and information about the ethnic cleansing of 170,000 Palestinians in 1948. Our leaflet Stop the Prawer Plan! gives more information about the Prawer Plan, and ways of protesting against it. 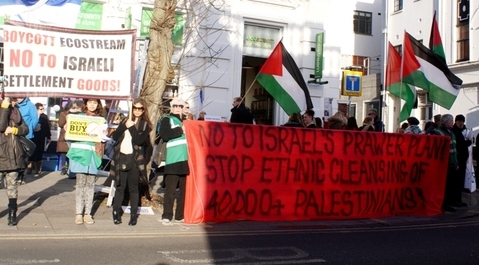 The demonstration took place outside Ecostream, the shop owned by Israeli company Sodastream, site of Palestine solidarity demonstrations several times a week since September 2012. 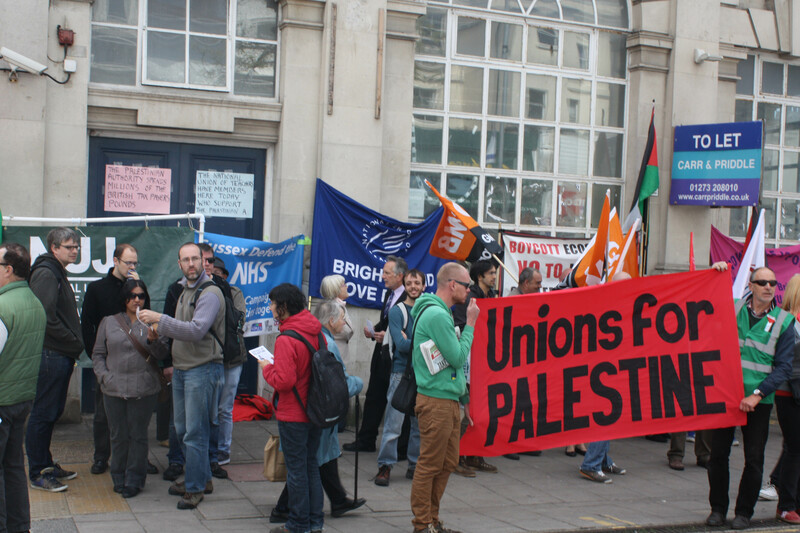 There was a really good turnout, bolstered by friends from Portsmouth Palestine Solidarity Campaign, and three local members who have just returned from Palestine. 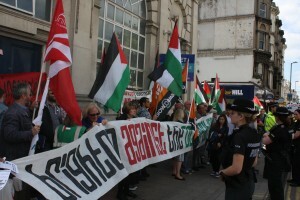 Sussex Friends of Israel were incensed to see us highlighting this latest atrocity being committed by the Israeli state, and did all they could, abetted by Sussex police, to stop our message being seen or heard by attempting to cover our banner with their flags. They eventually got bored of this, and returned to their standard tactics of standing in the street shouting absurd and racist comments at whim. We will continue to be outside the Ecostream shop in Brighton every Saturday 1 -3pm, calling for a boycott of all companies complicit in Israel’s occupation of Palestinian land and ethnic cleansing of Palestinian people. 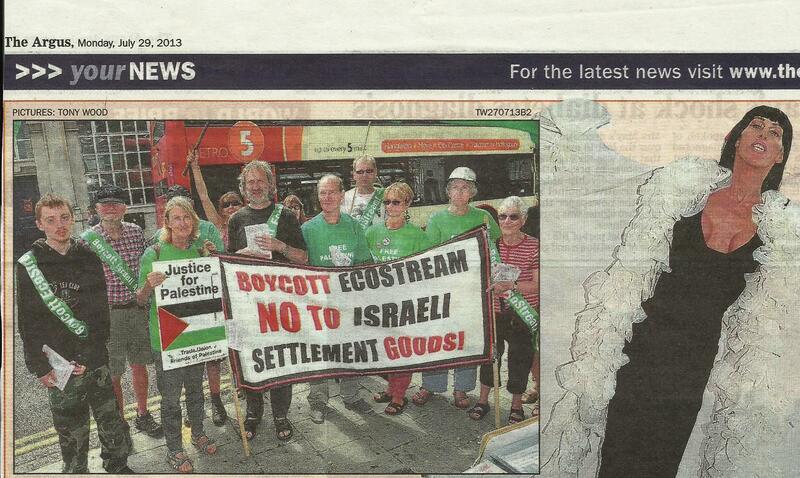 Our campaign against SodaStream – a toxic and deeply unethical company – goes from strength to strength! Our regular protests outside the company’s so-called eco-store in Western Road continue: in addition to our weekly picket of the shop on Saturdays, we now conduct a varied range of pop-up demos during the week. 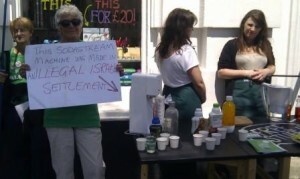 And whenever we appear there to draw attention to the unwholesome record of SodaStream in the illegally occupied Palestinian territory, the response from passers-by is still tremendously supportive. People are understandably appalled to learn the truth about the company, despite their attempts at green-washing their image. And we continue to recruit new people to support our protests. We will be there every Saturday from 1pm till 3pm for as long as the shop remains. 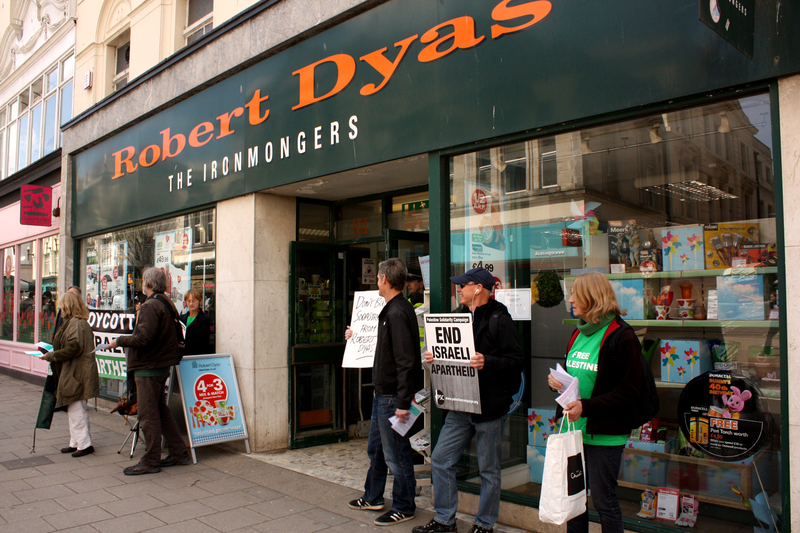 On Saturday the 16th of November we divided forces, with some of us picketing other stockists in the town, including Robert Dyas in Western Road, which is promoting SodaStream products in the run-up to Christmas. Shoppers were very interested to know the truth about the company. Many agreed to boycott SodaStream as part of an international protest against Israel’s policies of ethnic cleansing and its human rights abuses. Apologies to our many supporters for the gaps in our reporting on the progress of the campaign on our website. 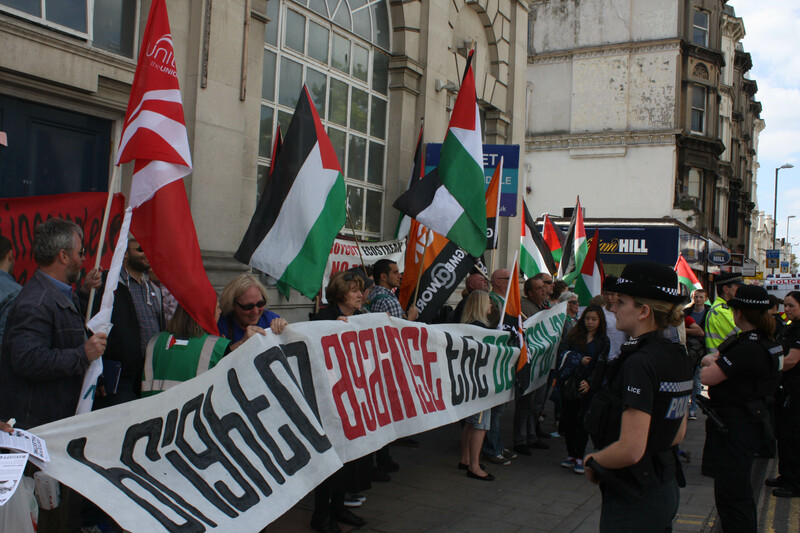 If you haven’t already seen it, have a look at our report on the Day of Action against SodaStream on the 28th of September 2013. 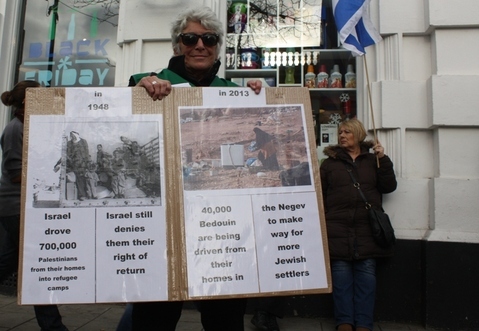 On Saturday we were treated to a bewildering display of zionist culture on the pavement outside the EcoStream shop in Western Road. For about 10 minutes, a transgender disco performer – apparently in a display of solidarity with the beleaguered shop – lip-synched and danced suggestively to tinny recorded music, and attempted to seduce the mystified passers-by. The zionist counter-demonstrators had earlier issued a press release announcing this stunt, prompting the Brighton Argus to send a photographer. The photographer duly turned up, looked suitably puzzled, took a few snaps, shrugged and made his escape. 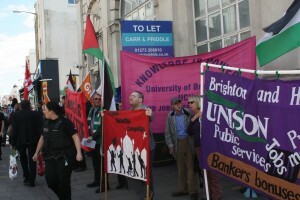 But the Argus coverage of the event, which appeared the following Monday, gave our boycott compaign clear prominence, and represented it as a serious political effort. How the zionists imagined their weird stunt would bolster the shop and its supporters is a mystery. The event provided us with some decent unsolicited publicity for our campaign – see below. Today saw the summer arrive at last, and also some new PR tactics on the part of Ecostream, in the way of a table set up outside the store offering free, fizzy drinks to thirsty shoppers and passersby. Unfortunately this slightly backfired, as the Sodastream machine making the drinks became the perfect visual vehicle to draw people’s attention to exactly what is manufactured in their illegal settlement factory, as the photo here shows! 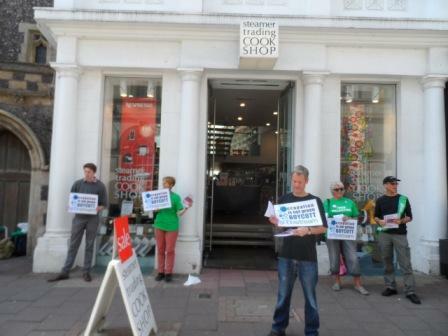 Our campaign to target other Brighton stockists of Sodastream products continued today with our first pickets of Steamer Trading in Ship Street. Leaflets were handed out to shoppers entering the store, many of whom were suprised to learn that Steamer Trading stocked Sodastream. Many shoppers already knew about the origins of Sodastream – our message must be getting through!.A useful conversation was also had with the staff, who were informed of the political and moral reasons for our protest. They also mentioned that the CEO of Sodastream UK had been to visit just the previous week – if only we had known!A letter has been sent to the managing director of Steamer Trading, Ben Phillips – we await his response. Saturday saw some long-awaited sunshine and another good turnout for the weekly Ecostream picket. This week was also the first of our actions against other local Sodastream stockists. 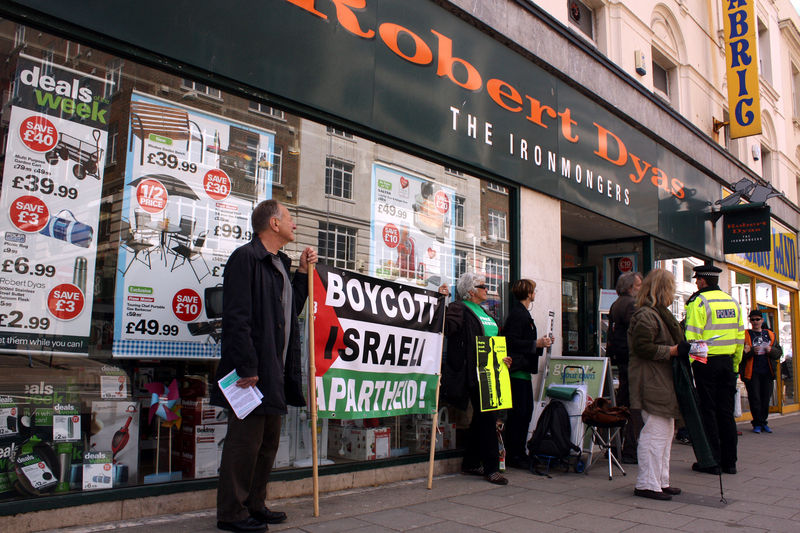 At 12.30, eight people gathered outside Robert Dyas on Western Road with placards asking shoppers not to buy Sodastream products from the store. A letter was also handed in to the manager explaining the reasons for our presence. Although he was unsure as to the ordering/contract situation, he agreed to pass it on, along with photos of our picket.Many passers-by were unaware that Robert Dyas sold Sodastream but an encouraging number said that they wouldn’t buy their products anyway. Our messsage seems to be getting out there! It was also refreshing not to have to deal with the counter-protesters who seemed oblivious of our presence just 200m away. After 30/40 minutes we left to join the main Ecostream demo and although (or because) we outnumbered the zionist/christians, they were at times quite aggressive. This led to a number of ‘incidents’, one of which resulted in one of our number being taken away by the police. It was agreed later that, although it is sometimes difficult not to react to provocation, it is in the picket’s best interests to try and stay dis-engaged from our ‘opponents’.We will of course be there again next Saturday at 1.00pm – please remember to wear something green if possible! 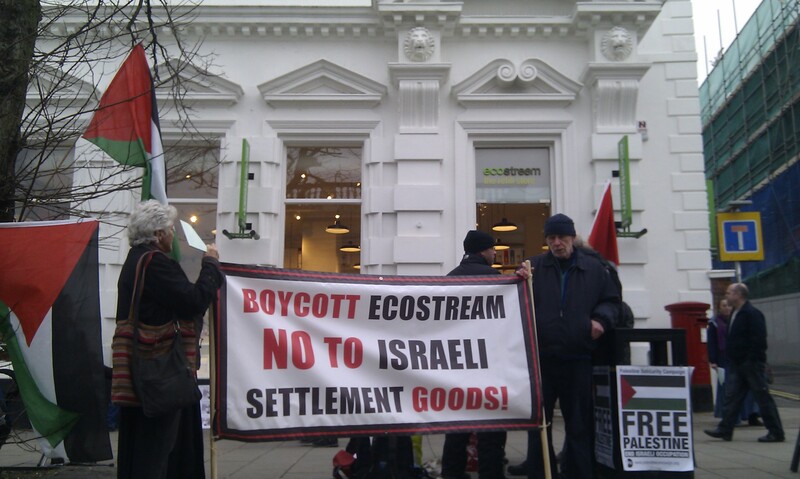 After 8 months of weekly pickets of the Ecostream store in Western Road, BHPSC and local BDS activists have decided to widen the campaign to include local stockists of the products of parent company, Sodastream. Sodastream’s main production facility is in one of the largest illegal Israeli settlements, Mishor Adumim, east of Jerusalem. SodaStream’s 2012 annual report to the American Stock Exchange lists the manufacturing functions taking place there as “metals, bottle blowing, machining, assembly, cylinder manufacturing, CO2 refills and cylinder retesting.” (Click here below for an up-to-date review of Sodastream’s production facilities). 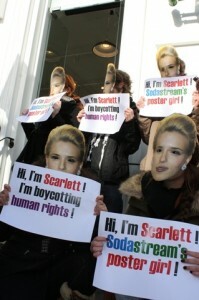 There is a growing international campaign focussing on Sodastream. 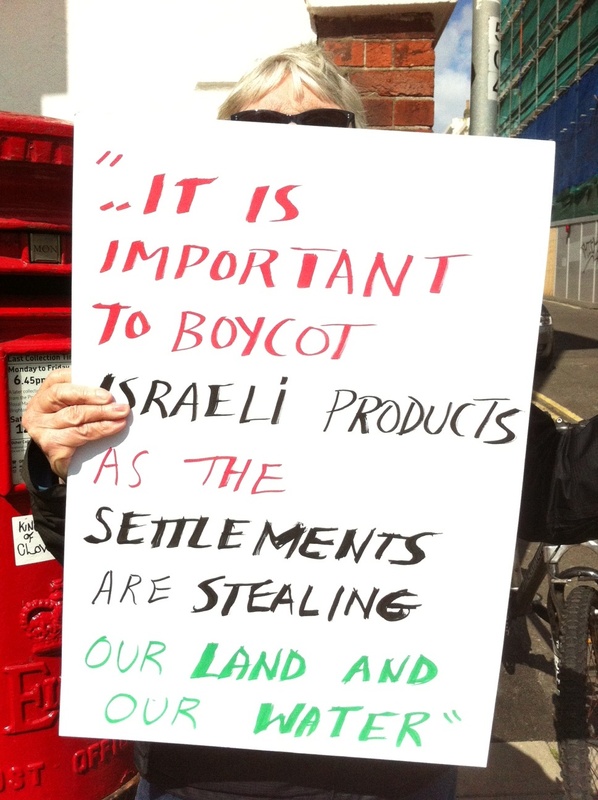 In the forthcoming weeks and months we will be making local Sodastream stockists aware of the reasons why they should not be selling products of a company that profits from an illegal occupation by maintaining the economic viability of the illegal settlements. 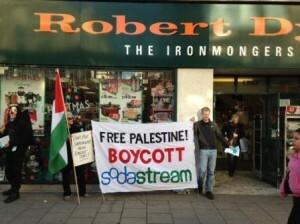 In the Brighton area stockists of Sodastream’s products include hardware chain Robert Dyas (74 Western Road), kitchenware outlets Steamer Trading (35 Ship Street) and Lakeland (Churchill Shopping Centre), Argos and Asda. As usual, we mounted a lively picket of the EcoStream store, with hundreds of local people stopping to find out more, to express their support, to take leaflets, and to sign our petition. The Zionists were in moderate evidence, and true to character they ‘occupied’ the traditional lands of BDS campaigners on the north side of Western Road. Their presence, though small, created confusion at the entrance to the shop, which ultimately served to dissuade EcoStream’s few remaining customers from entering. An own-goal for them! Most passers-by who took leaflets from the Zionists could be seen depositing them responsibly in litter bins as soon as they realised how mischievous and fictitious their propoganda is. Just in case there is any doubt that the EcoStream Store in Brighton is an outpost of the zionist entity! 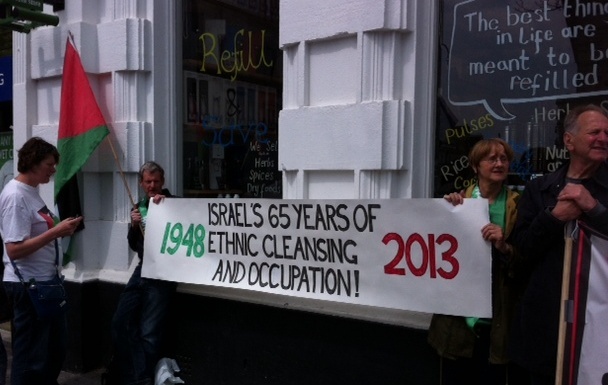 Our latest banner – a reminder that it is 65 years since the Nakba of 1948, and the suffering of the Palestinians only intensifies. On Saturday 27 April, local people once again demonstrated outside the EcoStream store in Western Road, protesting against the company’s involvement in the brutal occupation of Palestine. These protests started in September 2012, and have continued every week since that time. The demonstration was lively but entirely peaceful, conducted under a banner reading “Boycott EcoStream! 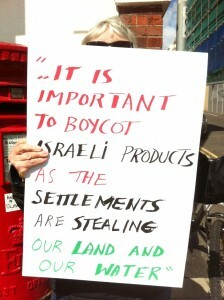 No to Israeli settlement goods!” The response from passers-by was mainly extremely sympathetic – hundreds of them asked for leaflets and further information, since they were shocked to discover the truth behind the local shop. The great majority of them agreed to boycott the shop, and many signed petitions. Similar protests will be organised every week for the foreseeable future. To mark ‘United Nations World Water Day 2013’ the weekly protest outside Sodastream’s Brighton shop, Ecostream, held a mini ‘Walk for Water’ and a teach-in titled ‘Palestinians are thirsting for Justice’. The ‘teach-in’ highlighted the connection between settlement companies, such as Israeli company Sodastream, and Israel’s theft of Palestinian water. It illustrated the massive discrepancy between water consumption in Israel’s illegal settlements in the West Bank, where settlers consume an average of 400 litres/person/day, and Palestinian communities living near the settlements, which have access to as little as 20 litres/person/day. To put this in its context, the World Health Organisation recommended daily minimum is 100 litres/person/day. Israel has enforced its apartheid allocation of water with over 2000 military orders which prevent Palestinians from accessing the water beneath their feet. These military orders prevent Palestinians living in Area C from digging wells, pumping water from rivers, collecting rainwater as it runs off the mountains, or using natural springs. 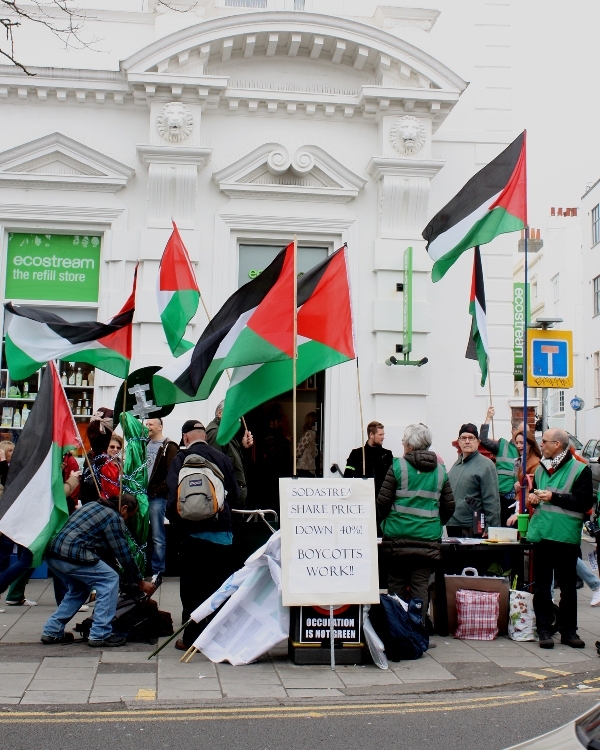 Palestine Solidarity activists have been holding pickets outside the Ecostram shop for over 6 months, since 9th September 2012, and each week the Sussex Friends of Israel (SFoI) hold a counter protest. 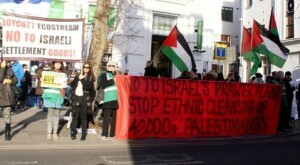 SFoI operate collaboratively with the management of the Ecostream Shop (using the shop to store their banners and flags, and using the shop’s facilities for ‘breaks’ during their protest). Their main aim is clearly to disrupt the Palestine Solidarity picket, and to prevent passers-by from hearing and seeing the information being provided about Israel’s apartheid policies. 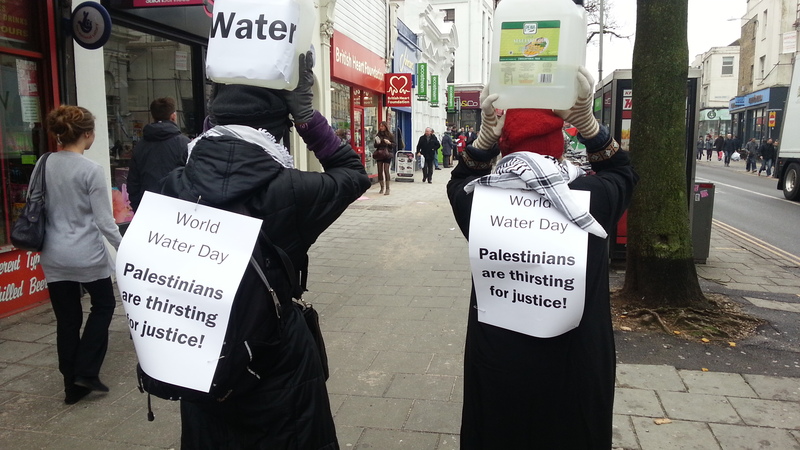 During the World Water Day ‘teach in’, Sussex Friends of Israel tried to drown out the information by playing loud music through their megaphone, blowing whistles and shouting. Later on they increased their aggressive and confrontational behaviour, once again attempting to drown out any information or chants by playing repeated pre-recorded messages and music through their megaphone, with one bearded man shouting distorted baby-like noises. He then made racist and abusive comments to a Sudanese supporter of the Palestine picket, and stood for some minutes giving a Nazi salute. Shortly after he was arrested on suspicion of ‘racially aggravated behaviour intended to cause harassment alarm or distress’. 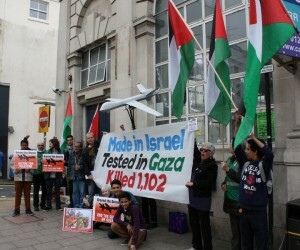 Nor wind nor rain, nor Zionist abuse… Despite inclement weather, the regular assembly gathered outside Ecostream this Saturday to protest the sale of products manufactured illegally. 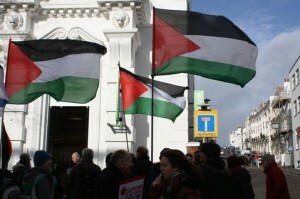 At any one time there were up to 25 protesters continuing an action which shows no sign of flagging after six months. 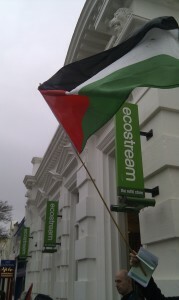 The fine new anti-Ecostream banner was on display, along with our usual Palestinian flags. Spirits were high and the responses of passers-by almost universally positive. The odd Zionist protester made an appearance. Thankfully a busy road between us muffled their comments, although they now have taken to posting large photographs of our group members on their placards – quite flattering, but surely harassment born of lack of valid counter-arguments? The weekly protests against the Ecostream store in Brighton show no sign of flagging. It is now over 6 months since Israeli company Sodastream opened its first UK “green” subsidiary on Western Road. 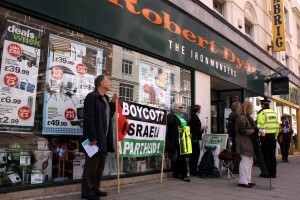 Every Saturday since, local Palestine Solidarity and BDS activists have mounted a picket outside the shop. On Saturday 9th March, over 20 protesters (including students from Yemen, Pakistan and Syria) gathered with banners and Palestinian flags. Hundreds of leaflets given to shoppers and passers-by explained the reality behind Ecostream’s image – that Sodastream’s main factory is in the illegal Israel settlement of Ma’ale Adumim in the occupied West Bank. Day trippers to Brighton stopped and offered encouragement, joining dozens in signing the petition objecting to the shop (available online at address below); and even with the (now regular) presence of a pro-Ecostream group of Zionists and biblical fundamentalists, only a handful of people entered the shop (which appears virtually empty most other days of the week as well). After a couple of hours and with some gutsy chants of “Free Palestine!”, another successful day’s picketing was declared. 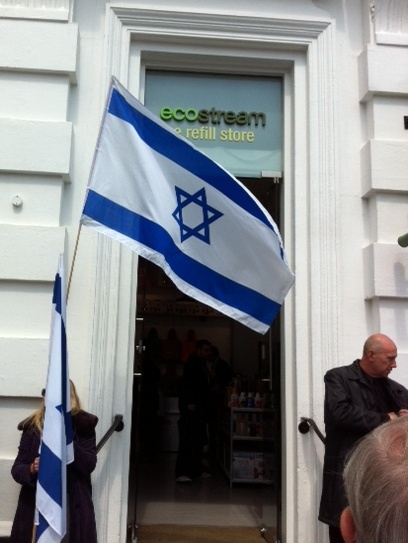 Needless to say, the campaign will continue until Sodastream realises that the people of Brighton will not support a business intrinsically linked to the illegal Israeli occupation, and they decide to close this store. On Saturday 23rd February a group of performers joined the weekly protest outside Ecostream to present their play: ‘TheTrial’. The play, written specifically for this occasion, imagines a day when Brighton’s most controversial shop, Ecostream, has to answer to its critics in court. The play explores the way SodaStream have promoted the environmental credentials of their product. This is balanced against the impact of their factory on Palestinians who work there, and those whose lives have been destroyed by the creation of settlements such as Mishor Adumim, where the main SodaStream factory is based. The court hears the testimony of a Palestinian worker, who is called as a witness by Sodastream, and a Bedouin woman, Wahde, who lost her home and her land when the settlement expanded. During the 20 minute long performance the play was persistently disrupted by supporters of ‘Sussex Friends of Israel’ who attempted to drown out the performance with heckles and shouting. The play has been created to give people in Brighton the opportunity to understand the reason for the protests that have taken place outside the Ecostream shop every week since last September. “We want people to know about the connection between companies such as EcoStream, and Israel’s illegal settlements in the West Bank. The settlements are being built on Palestinian land, and the indigenous population is being forcibly removed from their land to make space for the settlements. Palestinians living in the area are systematically refused access to water by the Israeli occupation. Whilst SodaStream expand their profits, using the slogan ‘set the bubbles free’ they are denying freedom and justice to Palestinians. SodaStream cannot claim to be environmentally friendly when it is complicit in the ethnic cleansing of Palestinian communities”. The play is also being performed in recognition of SodaStream’s attempts to prevent the truth about its company being published in Brighton.